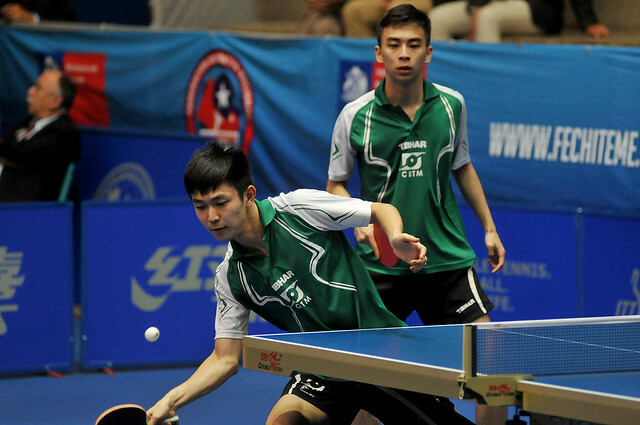 Hopes high for the host nation when play commenced in the third round of the Men’s Singles event at the Sparta 2018 ITTF Pan American Championships in Santiago, Chile on the late afternoon of Saturday 24th November; when the round ended, aspirations lay in ruins. Felipe Olivares, Juan Lamadrid and Gustavo Gomez all experienced defeat. Contrary to ranking, Gustavo Gomez, the no.7 seed, was beaten by Mexico’s Marcos Madrid, the no.9 seed (11-6, 11-3, 9-11, 11-9, 11-6); an upset but it was no great surprise. The 32 year old Mexican has a wealth of experience. Notably he competed in the Rio 2016 Olympic Games and earlier this year won the Men’s Singles title at the 2018 Central American and Caribbean Games. Defeat for Gustavo Gomez when facing a lower ranked player, for Felipe Olivares and Juan Lamadrid it was the opposite scenario. Felipe Olivares was beaten by Brazil’s Thiago Monteiro, the no.8 seed (11-9, 11-4, 11-7, 11-8); Juan Lamadrid suffered at the hands of Argentina’s Horacio Cifuentes, the no.5 seed (11-9, 11-5, 11-4, 11-8). Success for Thiago Monteiro, for colleagues Eric Jouti, the no.3 seed and Humberto Manhani, the surprise third round name having no current world ranking, it was differing fortunes. Eric Jouti accounted for Puerto Rico’s Daniel Gonzalez, the no.14 seed (11-4, 13-11, 11-8, 11-4); conversely, Humberto Manhani lost to Paraguay’s Marcelo Aguirre, the no.2 seed (7-11, 11-7, 11-7, 11-6, 11-8). Defeat for Daniel Gonzalez but there was success in the third round of the Men’s Singles event for Puerto Rico; Brian Afanador, the no.6 seed, ended the progress of Cuba’s Jorge Campos, the no.20 seed (11-7, 9-11, 11-7, 11-7, 11-3, 11-7). Wins as status advised, it was the same for Ecuador’s Alberto Miño, the no.4 seed; playing his umpteenth match against the Dominican Republic’s Emil Santos, the no.16 seed (11-4, 12-10, 10-12, 11-7, 11-6). A hard fought win for the Ecuadorian, for Kanak Jha of the United States, the top seed, life could not have been easier. He received a walk-over when due to face Canada’s Eugene Wang, the no.22 seed. At the semi-final stage, Kanak Jha meets Brian Afanador, Thiago Monteiro faces Alberto Miño; in the opposite half of the draw Eric Jouti confronts Horacio Cifuentes, Marcos Madrid plays Marcelo Aguirre.